Join us Saturday, December 5, 2015 from 10:30-4:30 for a Nuno Felted Scarf workshop. The cost of the workshop is $85.00 and includes all the beautiful hand dyed fibers, ribbons and silk you need to create this lovely project. Vickie Clontz will lead the workshop. Wear warm, comfortable clothes. Bring a pair of rubber gloves and a beach towel. Call 704-614-4745 to reserve your space. Looking forward to September 19, when hopefully the weather has cooled a bit, The Fibre Studio will be hosting another wonderful “wet-felting” workshop with Vickie Clontz. 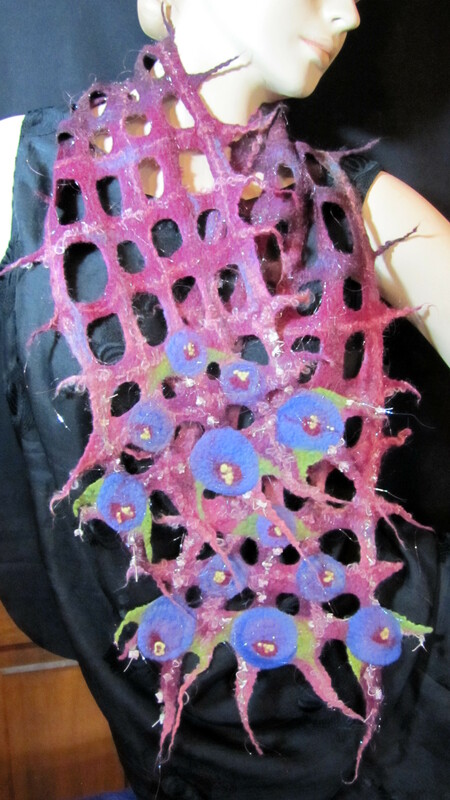 We will be “wet-felting” a beautiful airy wool scarf or table runner in your favorite colors! We will embellish our piece with lustrous bamboo and silk fibers, sparkly Angelina, and delicate wool nepps. You may bring in bits and pieces of yarns from your stash to incorporate into your project (although is not necessary). No rolling is needed; however, it is a bit physical. Price of the workshop is $85.00 – which includes all materials – a kit of wool fibers, Angelina, silk fibers, wool nepps, and some yarn in an array of colors. We will be taking a lunch half-way through. You may bring your lunch of for an additional $10.00 a box lunch will be provided. Please call The Fibre Studio, 704-614-4745, to reserve your spot. Please mention if you would like a box lunch.